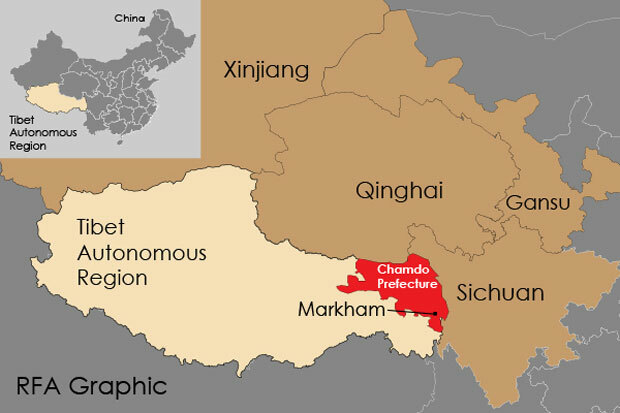 (TibetanReview.net, Apr03’16) – A Tibetan man has committed suicide in a police detention centre in Markham (Chinese: Mangkang) County of Chamdo (Changdu, or Qamdo) prefecture, Tibet Autonomous Region, while an unknown number of other Tibetans have been arrested for protesting against the Chinese police for having driven the man to this only possible escape from their torture, reported the Tibetan Service of Radio Free Asia (Washington) Apr 1. The deceased has been named as Tashi, a man in his 30s. He had been arrested shortly before the 57th Tibetan national uprising anniversary of Mar 10, 2016 for unknown reasons. The report said Tashi died on Mar 11 in the county’s Tsangshul detention centre. It was not clear how Tashi, family name Deyang, took his own life. After learning of the suicide, a group of local Tibetans staged a protest in front of the local Chinese police station. The police took video picture of the protest and used it to arrest everyone who had taken part in it. Following these developments, the authorities launched a security clampdown. All Tibetan residents of Markham who were outside the county on business were ordered to return home within 15 days. The report also said that because the internet had remained blocked in the county for quite some time, it was difficult to obtain information about the situation there, including about Tashi’s arrest, his suicide and related developments.